online press kit, reviews and more! Kat is and artist and singer living in New Orleans. She has had a diverse life with different influences on her musicality and artistry. She had many piano lessons. She was the first woman golfer to compete on the men’s team while she was a cadet at the United States Military Academy at West Point among the third class of women. Kat has a BA in Theater Arts with a minor in dance from PLU in Tacoma, WA. She apprenticed for 8 years under the late great artist Peter Walker doing much of his underpainting. 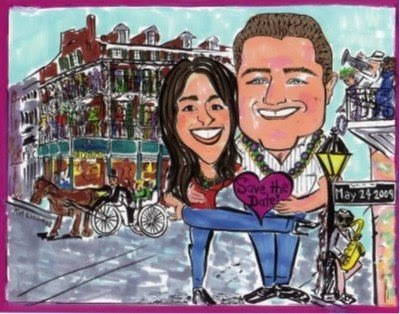 She has shows in New Orleans and does caricatures for events and private clients. Kat fronted a performance art rock bank called Kat & The Rhythm Rats in Los Angeles, CA(venues include: opening for Chuck E. Weiss at the Central(now the Viper Room)on Sunset Blvd & Whiskey A Go Go), Kat fronted a blues band also in Los Angeles, CA(venues include: Mama Pajamas and Molly Malones. In New Orleans, performance highlights since Hurricane Katrina (where Kat's house, like so many others, took 6 feet of water) include The New Orleans Jazz and Heritage Festival, The New Orleans Jazz National Historical Park, French Quarter Fest, Parkway, Temple Sinai, Tipitinas, The Big Top.